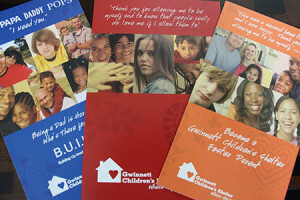 The Gwinnett Children’s Shelter (GCS), which provides short- and long-term care for children and youth in crisis, annually serves approximately 350 youth directly, and 6,000 youth/200 families through community services programs, including multi-lingual parenting classes, volunteer opportunities, in-home family support and counseling, and runaway prevention and intervention. The Shelter needed to raise money to build a long-term care facility, but they had a low awareness in the community, and did not have current marketing materials to help educate and motivate potential funders to give. c21 conducted a communications audit, reviewing collateral materials, logo, taglines, websites and even interviewing staff, board members, volunteers and community service providers. Our research showed the Shelter had limited public awareness and was misperceived as an orphanage with an endless supply of state and county funds for housing abused, poor, black, ‘bad’ kids. Of course, this was far from the truth. Based on the plan, we developed a new logo, brochures in English, Spanish and Korean, new stationery system, a pocket folder, customizable insert sheets, a PowerPoint presentation template, a website design template and video. While we could not use images of the residents, we used their “voices” – quotes taken from the testimonial letters we read during the audit – incorporating them throughout the materials to reinforce that the Shelter is truly the place “where hope lives.” We selected stock photography to include a diverse mix of cultures, ages and expressions to closely represent the Shelter’s real life residents and the families who are helped everyday. We also included a very specific list of needs, and a call to action so people could donate money or time. The Shelter’s executive director and development director said that potential funders positively responded to the new materials and made generous donations. As a result, the Shelter successfully raised the needed funding and completed the long-term care shelter within one year.